We all like to think we can solve a murder given the right clues. Here’s a chance to use mathematics skills to identify “whodunit” for ages 12-14. The students are given the data or a diagram to solve a “problem” – which of various characters is a murderer. To find out, the student must solve all or most of the questions on the sheet to identify wrong answers as well as correct ones. Problems are staged, so there is an element of suspense for the individual…and racing between students to solve the mystery. 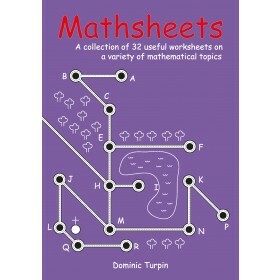 The topics covered in this book are all included in the year 7 & 8 schemes of work in mathematics. The tasks have been used successfully with older pupils too as a reminder of topics covered previously. They would also be suitable for younger pupils who have met the appropriate language and content. They are likely to take about 40 minutes but this will depend on the ability of the class to coordinate the different aspects of each task. For ages 13-15 see the sister titles More Mini Mathematical Murder Mysteries. The book is aimed at both teachers and parents.